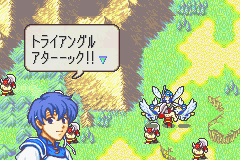 A special attack, which features in many of the games, usually reserved for the Pegasus sisters. In this game, two trios of characters can perform it: Thany, Tate and Yuno (the Pegasus sisters) and Bors, Wendy and Barth (the Armour Knight trio). Triangle Attack with map animations. To activate it, position all three characters of a trio so that they are adjacent to the same enemy (like in the above screenshot). In this formation, making any of the characters attack will cause them to perform the Triangle Attack. The Silver Card is hidden in the desert sand in Chapter 14. With the Silver Card in their inventory, a character can purchase items for half price. To find its location and more information, please check this page. The Member Card is held by Hugh in Chapter 16. You can obtain it by either recruiting him (which costs 5,000 to 10,000 Gold) or making a Thief steal it from him. With the Member Card in their inventory, a character can enter Secret Shops (their locations can be found here), which sell rare items not usually found in normal shops. Hard mode, which is a difficulty setting above the game’s normal difficulty, can be accessed by starting a new game. Trial Maps are available, which are battle maps that you can challenge with your end-game characters. After completion of a Trial Map, everything (including all gained attributes, experience, etc.) is reset. Sound Room is available, where you can listen to the game’s music. Character unique palettes can be toggled On or Off in the Configurations menu. The current playthrough number is displayed in the Status menu. Character movement (on the map) can be sped up by holding the A button. Two Trial Maps are available by default- one more can be unlocked by completing the Final Chapter in Normal mode, another for completing Chapter 22 in Hard mode and a final one by completing the Final Chapter in Hard mode. Additionally, four limited-edition Trial Maps could be obtained in various events and competitions in Japan. Each time the game is completed (from the beginning to the end), a new exclusive character is unlocked to be used in the Trial Maps. Once the character is unlocked, they can be used in the Trial Maps by any end-game file. More detailed information can be found here. Normally Fa can only attack with her limited-use Divine Dragonstone. However it is possible, via a glitch, to give her an unlimited-use Fire Dragonstone to attack with. 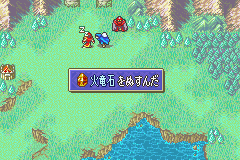 First, you will need to play a chapter where there is both an enemy staff-user, with a Berserk staff, and an enemy Mamkute. Chapters 22 and 23 should fulfill both criteria. Also you will need a Thief character. Make your Thief enter the staff-user’s range and let them become Berserked. Before the player’s turn ends, if the Mamkute is nearby, the Thief should move towards the Mamkute and steal their Fire Dragonstone. Since the game doesn’t expect Fa to obtain a Fire Dragonstone, she doesn’t have a proper battle animation when attacking with it (instead, she becomes a discoloured floating dragon head).